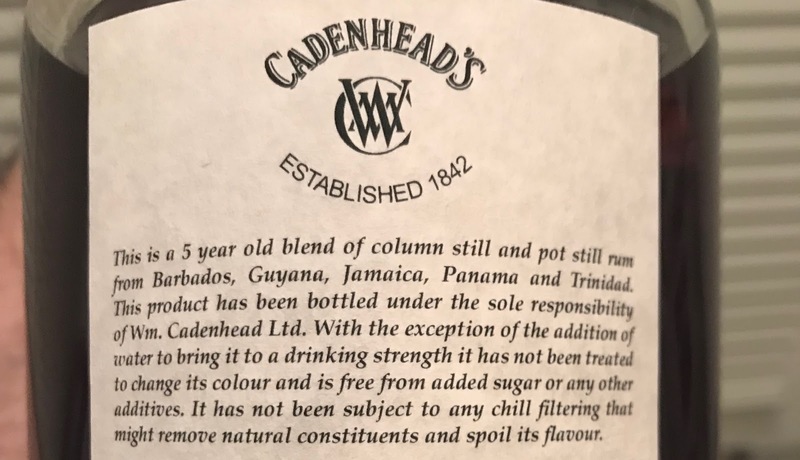 Cadenhead's Classic Rum (50.0%): The third rum in a row for the whisky-alternative January is a blended one bottled by widely known and respected independent bottling company Cadenhead's. Although the front label doesn't reveal too much information except stating that it is a product of The West Indies the back label says that it is a five year old blend of column and pot still rums from Barbados, Guyana, Jamaica, Panama and Trinidad. (Thanks to Mark Watt for the warning...) It is a permanent label of Cadenhead's but the components of this particular blend vary from batch to batch. It doesn't contain any coloring agent and/or added sugar. Color: Dark amber, copper with a blood orange hue. Thick but rather quick legs. Nose: Carrot cake, dark muscovado sugar and nutmeg. A little mold, fresh mushrooms and black damp dirt. Fennel, dill and toasted oak staves. Way more impressive on the nose than I expected... Adding a few drops of water thins out the earthy and foresty aromas and adds more sweet spices: cinnamon, cloves and garam masala. Palate: Hot and warming... Brown sugar, milk chocolate, cinnamon and cloves. Adding water brings out stewed fruits, prunes and ripe damson plums. Thick and mouth covering texture. Very enjoyable... Black peppercorns and roasted macadamia nuts. Late edit: I figured out that it also benefits immensely from airing. After letting it sit for quite some time it calms down, gets sweeter and mellower. Finish: Long but soft. Nutmeg and cinnamon. Overall: Absolutely loved it... I admit that it is a tad pricey but the liquid in the bottle totally justifies it. A good rum to offer to a whisky lover who is so convinced that he hates rums... It's totally good to sip neat and for my two cents its 50% abv is spot on. I probably won't use it in cocktails because but if you do who am I to judge..? It definitely will do great in any cocktail. At the end long story short it is highly recommended.